Size/shape: Rondelles are round beads which are wider than they are long or thick. 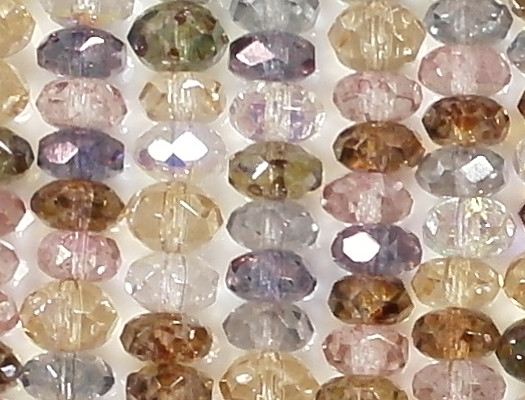 (These rondelles are faceted.) The sizes range from about 4mm x 6mm (or a tad smaller) to 5mm x 7mm (or a tad bigger). Please see "Comments" below. 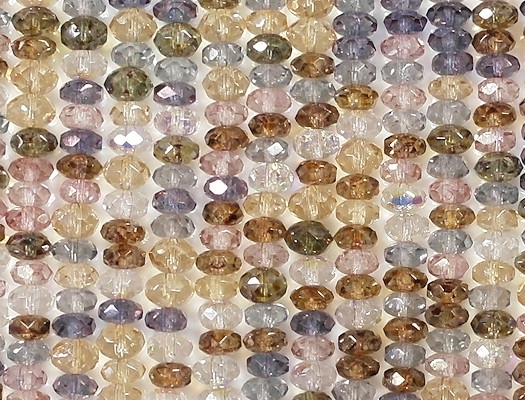 Colors/description: A mixture of colors: Clear, clear AB, light pink, light topaz, light blue, brown with gold luster, dark blue and olive green with luster. 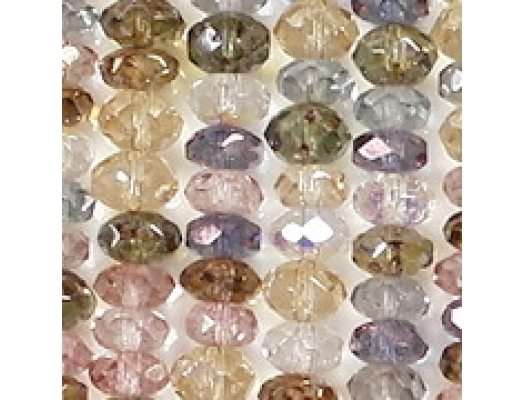 Defects: The obvious defect of these beads is that they aren't all the same shape! (See Comments below.) 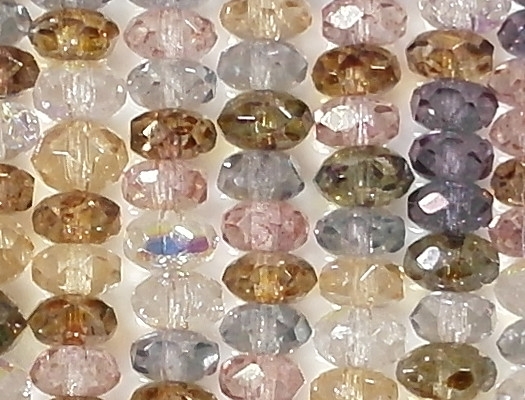 Also, fire-polished faceted beads always have some imperfect facets. 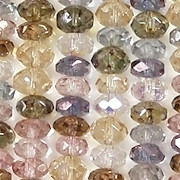 Comments: Important: I'm very annoyed with my supplier for mixing together different size beads. The Czech bead business has fallen on hard times (it isn't clear why), and my main supplier (which owns its own Czech bead factory) has stopped making almost all of their bead styles except for a few with sythetic coatings. I purchased these beads before, and they were all a consistent size. It appears that the manufacturer mixed together beads that were not meant to be together. They are calling these beads "5mm x 7mm" beads, but most of them are around 4mm x 6mm, or even smaller. I like the colors that they mixed together, but they shouldn't have mixed sizes like that. I didn't return the beads because I set them aside and forgot about them. 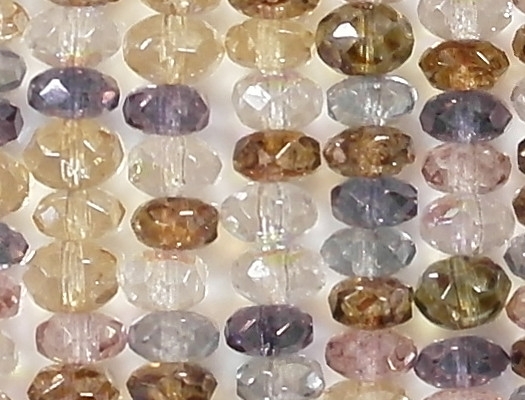 The beads which seem to be the largest are the darker beads plus some of the light topaz beads. The beads were not cheap, so I am taking less of a markup than I usually do. However, they are perfectly fine beads. You could separated the large from the small, or you could use them in informal jewelry.